While 3D scanners can scan most objects without a hitch, there are some surfaces that are more challenging to scan. These types of surfaces include dark, shiny, and transparent surfaces. Why are these surfaces difficult to scan? 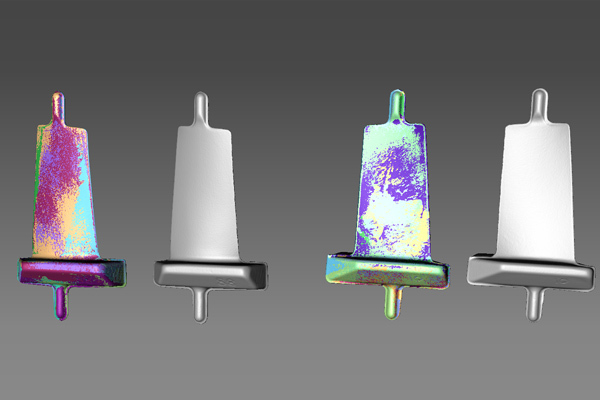 It’s due to how the 3D scanner interacts with these types of surfaces that causes a less than ideal scanning condition. Optical light-based 3D scanners (i.e. laser, structured-light) use light as a projection source. Using a structured-light 3D scanner as an example, the system projects a series of patterns onto the object using the projection source. The pattern deforms as it hits the surface of the object. The scanner’s cameras capture images of these patterns in order to calculate distance from the scanner to the object’s surface. This is how the scanner derives 3D measurements in the form of point clouds (a cluster of 3D coordinates) of an object in order to produce a digital replica of the part. However, some types of surfaces cause the light to be distorted in such a way that it interferes with the data acquisition process. Some 3D scanners are pretty good at adapting to surface variations. Before you try other methods, see if your 3D scanner’s settings can be adjusted to scanning dark, shiny, or transparent parts. Each scanner will be different but usually adjusting the exposure settings helps to compensate for the object’s surface characteristics to create a better condition for scanning. Using the Artec 3D scanner as an example, taking simple actions such as increasing the scanner’s sensitivity and slightly decreasing the brightness helped with scanning this black robe. We can capture even metal parts using the Artec Space Spider without any special treatment. If you want to scan holes or tight corners with cleaner scan results (as light bounces around these features) or if you have an extremely shiny part to scan, we would recommend using a developer spray to prepare the part to get the best results (which is discussed further in the next section). There are some extreme cases when your 3D scanner is unable to scan properly even when you have the most ideal scanner settings. In those cases, you will need to spray the part with a matte opaque coating to cover the surface. The challenging surface is covered so it doesn’t cause issues during scanning. 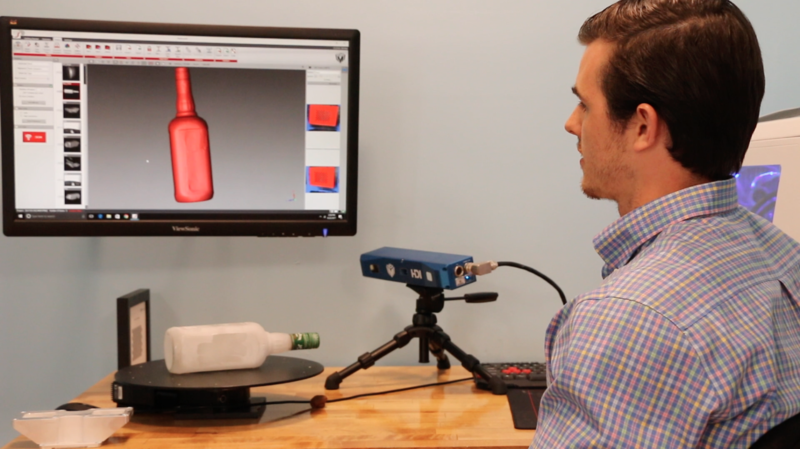 At our lab, we use Magnaflux Spotcheck® SKD-S2 developer spray to coat the part for 3D scanning. It’s simple and easy to use. It’s a powdered aerosol spray that coats a very thin film. We don’t have to worry about adding too many layers to the part as that can cause distortion to the accuracy of the 3D scans, especially when you are using the scan data for inspection or reverse engineering applications. Spray on an even, thin, uniform layer throughout the part. If you have a heavy thick coating it will influence the accuracy of the 3D scans. To minimize the particles in indoor space, you can spray the part in a spray booth or outdoors. It’s a temporary coating that easily comes off. You can wipe off the spray after the part is scanned with a cloth so it won’t damage the part. To summarize, here is a video where Tom explains the step-by-step process of scanning challenging surfaces using a metal part (shiny surface), a mouse (black surface), and a glass bottle (clear surface). Do you have other tips and tricks for scanning dark, shiny, or transparent surfaces? Please share them with us in the comment section.